This was a time when players willingly cooperated with photographers as these photographic artists used great imagination in creating and preserving intriguing and interesting moments… Before long lenses and photographers had to get close to the action, sometimes in harms way and in the way. 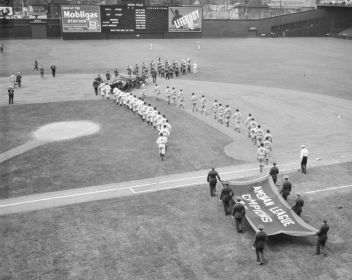 In the three decades between 1920 and 1950, the Detroit Tigers won four American League pennants, the first world championship in team history in 1935, and a second world crown ten years later. 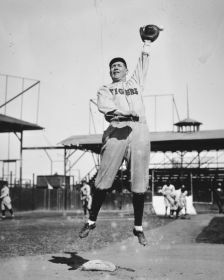 Star players of this era—including Ty Cobb, Harry Heilmann, Charlie Gehringer, Hank Greenberg, Mickey Cochrane, George Kell, and Hal Newhouser—represent the majority of Tigers players inducted into the Hall of Fame. Sports writers followed the team feverishly, and fans packed Navin Field (later Briggs Stadium) to cheer on the high-flying Tigers, with the first record season attendance of one million recorded in 1924 and surpassed eight more times before 1950. 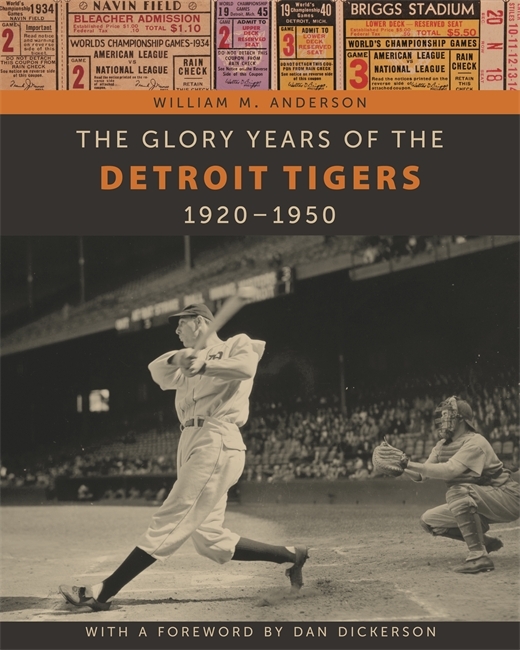 In The Glory Years of the Detroit Tigers: 1920–1950, author William M. Anderson combines historical narrative and photographs of these years to argue that these years were the greatest in the history of the franchise. 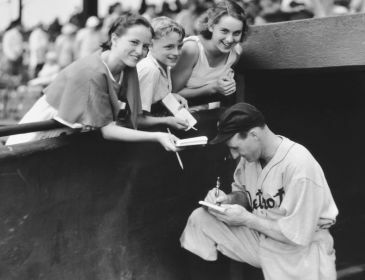 Anderson presents over 350 unique and lively images, mostly culled from the remarkable Detroit News archive, that showcase players’ personalities as well as their exploits on the field. For their meticulous coverage and colorful style, Anderson consults Tigers reporting from the three daily Detroit newspapers of the era (the Detroit News, Detroit Free Press, and Detroit Times) and the Sporting News, which was known then as the "Baseball Bible." Some especially compelling columns are reproduced intact to give readers a feel for the exciting and careful reporting of these years. 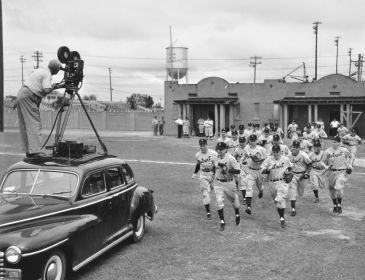 Anderson combines historical text with photos in six topical chapters: "Spring Training: When Dreams are Entertained," "Franchise Stars," "The Supporting Cast," "Moments of Glory and Notable Games," "The War Years," and "The Old Ballpark: Where Legends and Memories Were Made." Anderson presents sketches of many fine players who have been overlooked in other histories and visits characters who often acted in strange ways: Dizzy Trout, Gee Walker, Elwood "Boots" "The Baron" Poffenbeger, and Louis "Bobo" "Buck" Newsom. Tigers fans and anyone interested in local sports culture will enjoy this comprehensive and compelling look into the glory years of Tigers history. William M. Anderson is the retired founding director of the Michigan Department of History, Arts, and Libraries and also had a thirty-three-year career in higher education, during which time he served as president of Carl Sandburg College in Galesburg, Illinois, and West Shore Community College near Scottville, Michigan. Dr. Anderson is a widely published baseball and Civil War historian, a past president of the Historical Society of Michigan, and a past member of the Michigan Humanities Council. He is the author or editor of ten books, including The Detroit Tigers: A Pictorial Celebration of the Greatest Players and Moments in Tigers History (Wayne State University Press, 2008). William M. Anderson, who’s produced some striking coffee-table-style books on the Tigers in the past, would like you to think back – way, way, back – to nearly a century ago. His time frame is 1920-50, an era that takes in virtually all of the Tigers greats of yore who are now in that great baseball game in the sky. . . . We highly recommend this book. This book is as fascinating as a museum tour. The photography - original archived photos from The Detroit News - blends with outstanding story-telling to offer an experience that is as fascinating as it is entertaining. Any follower of the Tigers, or of baseball, should have this on the nightstand or in the living room bookcase. Anderson, who has done marvelous work on previous baseball books about the Tigers, turned this effort into a masterpiece of text and Tigers pictorial history. There are portraits of Hank Greenberg, Charlie Gehringer, and Mickey Cochrane, Schoolboy Rowe, Tommy Bridges - wonderful writing that is enhanced and brightened by the stream of original photos that deliver you, in a kind of time warp, to baseball's foundational era in Detroit. You do not have to be a person who lived during that era to appreciate this book. Rather, it will acquaint you with a team and with a baseball town whose names you know and whose stories have been told. But those stories, and those photos, have never been presented in a manner as compelling as in this book. Anyone with a deep interest in the modern-day Detroit Tigers revels in a great baseball teams-and towns-history. We now have our museum treasure: William M. Andersons brilliant and comprehensive book, The Glory Years of the Detroit Tigers, is an immensely entertaining and important archive rich in photographs and writing celebrating the days of Cobb, Cochrane, Gehringer, Heilmann, Greenberg, Newhouser, and others who made Detroit an American baseball bastion. With the charm of a natural storyteller, William M. Anderson captures the lusty decades of the heavy-hitting Detroit Tigers. If you thrill to the crack of the bat and the flight of the ball, this is a book you will treasure. This was a time when players willingly cooperated with photographers as these photographic artists used great imagination in creating and preserving intriguing and interesting moments. . . . Before long lenses and photographers had to get close to the action, sometimes in harms way and in the way." As rich as the history of the Detroit Tigers has been, there have been few great books written on their history. 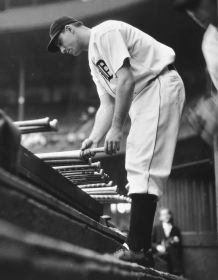 The Glory Years of the Detroit Tigers: 1920-1950 deserves to join Richard Bak's Cobb Would Have Caught It and The Detroit Tigers Reader by Tom Stanton among the best written on the subject. . . The book is more than 440 pages long and includes more than 120 photos, many of them probably not seen by even the most ardent Tigers fan. 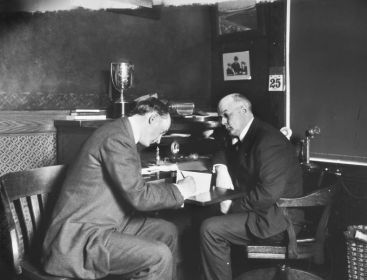 Not only did Anderson select more than 350 unique black-and-white images, mostly from the News, but he also combed back issues of the Detroit Free Press, Detroit Times and The Sporting News to help trace the history behind the players of that era for his colorful and in-depth narrative. In addition to its authoritative historical narrative (Anderson is the retired founding director of the Michigan Department of History, Arts, and Libraries), the book is enlivened by 300 images. Even fans with only a passing knowledge of the sport will enjoy the vintage photographs of the stadium, players, and surrounding city. 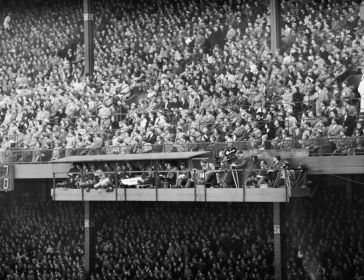 Included are street scenes depicting celebrations of the city's first World Series championship in 1935, fans at Detroit's Union Station awaiting the return of the victors in 1945, an aerial panorama of Briggs Stadium and the downtown skyline, and a July 4, 1940, image of 57,633 spectators cramming the old ballpark for a holiday doubleheader. The Glory Years of the Detroit Tigers draws on an impressive collection of interviews, photographs, and personal and professional documents to explore the development of the storied franchise in the early to mid-twentieth century. . . Anderson includes an entire chapter on Tiger Stadium, and it is here that his collection of photographs takes center stage. Combined with the words of players, managers, executives, and fans, these images reveal a team and city that was changing rapidly under new social and cultural forces. However, Glory Years is first and foremost a book about baseball, and the stories held within reveal new and exciting information about a team that continues to hold the state's loyalty. The Glory Years of the Detroit Tigers: 1920-1950 provides a fascinating look at three exciting and memorable decades of the popular baseball team. . . The exceptional use of large, clear photographs make the entire time period vividly come to life; Anderson also added crisp images from his personal collection. Bill Anderson's The Glory Years of the Detroit Tigers is a great gift to Tiger fans in particular, but also to baseball fans everywhere. The many pictures that appear with the outstanding text make this book unique. 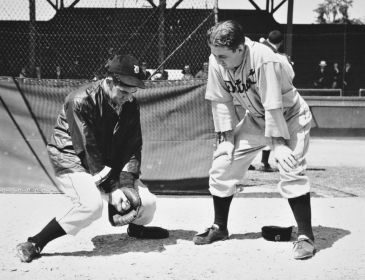 The years of 1920 to 1950 were the Glory Days of Detroit, and the Tigers were major contributors to that glory. William M. Anderson vividly recaptures the glory years of the Tigers in this wonderful testament to a bygone time. Fans who don't know much about this great era in Detroit baseball history are in for a treat. Those who think they already have seen and heard it all will be dazzled by the rare images Anderson has culled from his personal collection and the archives of the Detroit News. While the biographies of Mickey Cochrane, Goose Goslinand Hank Greenberg are sure to educate and entertain, the best part of this book is the photographic presentation of days gone by. More than three hundred photos, many coming from the archives of Detroit News, take the reader back to the black-and-white era when the game was simpler, undefiled by wild cards and steroid scandals. Images of Dizzy Trout goofing around with a camera on top of a car, Greenberg connecting for a home run at Crosley Field in the 1940 World Series, Schoolboy Rowe in his Navy duds, and several shots of the stadium inside and out make this book worthy of a spot on any baseball fan's bookshelf. William M. Anderson's wonderful book The Glory Years of the Detroit Tigers has brought back many special memories of playing at Briggs Stadium for those great Tiger fans. Seeing these rare photographs reminds me how lucky I was to have played with Hank Greenberg, George Kell, Hal Newhouser, Dizzy Trout, Hoot Evers, and all of my other teammates.